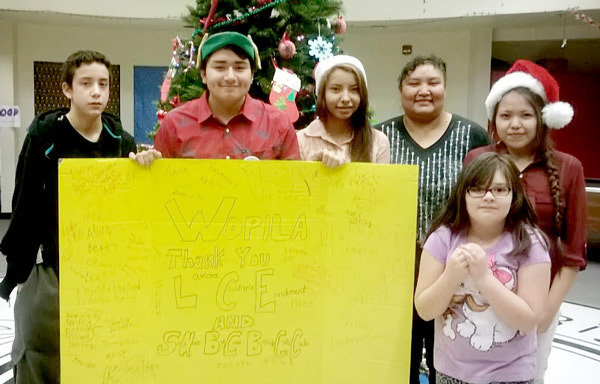 Over the last few years Lakota Children’s Enrichment has expanded its focus to help youth develop essential skills to help combat low self esteem and the negative pressures to drop out of school. While we continue to fill emergency needs, we address high impact goals by providing youth with opportunities for expression and leadership through sports, music, writing, art and mentorship — opportunities that most Americans take for granted. In 2013, we launched three new programs to engage youth: an annual Writing Challenge, Youth Summits and a Youth Advisory Board (YAB). 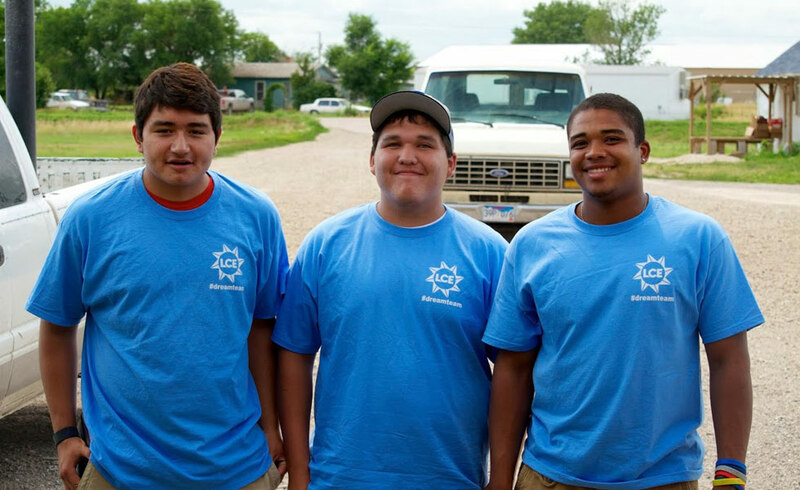 Our YAB is composed of amazing youth from across the Reservation and they are proving that the sky is the limit. Despite the pressures to drop out of school, all YAB members remain in school and hope to attend college, or attend college. We continue to support and engage YAB members through the college years. Studies have shown that students from Pine Ridge often drop out of college due to financial, social or educational barriers. Advocacy remains a huge priority, as we have found that an alarming number of people are completely uneducated about the history, obligations and obstacles facing the Lakota and other tribal nations. It is hard to believe that Elementary school children are taught that there are 50 states, but never even hear about the 566 registered tribes and 200 more fighting for state and federal recognition — even though they are the decedents of the first inhabitants of Turtle Island. Thank you for your continuing support – we can’t do it without you. If you get a chance, please visit our Donation Page — even small monthly contributions add up and will help keep our programs going. 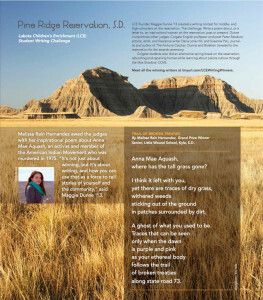 Writing Challenge Judges were: Armenian Genocide Expert and best selling author Peter Balakian, Iranian American author and journalist Susanne Pari, Oglala Lakota author and journalist Dana Lone Hill and LCE’s Maggie Dunne. The High School Grand Prize went to Melissa Hernandez, who submitted a moving poem about former AIM activist Anna Mae Aquash. I am Oglala Lakota from the Pine Ridge Reservation. I am also a freelance writer and contribute to such media as The Guardian and LA Progressive. I had the privilege in March to be a judge for the first ever writing contest for the youth of our reservation. It was inspiring to see the voices of our future. I encourage them to continue with their passion for writing…so someday, they are not the only voice but one of many telling our stories. 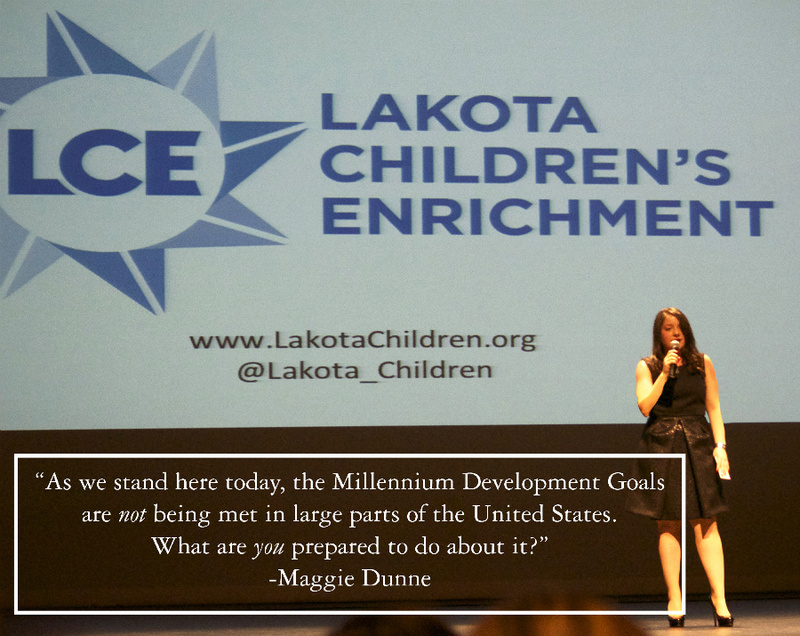 Wopila (thank you) to Lakota Children’s Enrichment and Maggie Dunne for inspiring the youth and letting them realize, they too can be heard. We installed our first Youth Advisory Board, composed of teens across the Reservation who want to continue in school and give back to their communities. In 2013, our YAB met, exchanged ideas and participated in leadership training to prepare them to help run LCE’s first Game Changers Youth Summit. Youth Advisory Board Chair Keith Martinez became our first Youth Board member to receive national recognition for his service to the youth of Pine Ridge Reservation. In the fall of 2013 he was named a National Child Awareness Month Youth Ambassador for the State of South Dakota by Youth Service America. We held our first Game Changers Youth Summit in August 2013 and united young people from across the Reservation who want to continue in education and improve their world. Throughout the program they discussed their goals, dreams and what they care about. The event was closed by a free concert by everyone’s favorite Alter-Native Rock Band, Scatter Their Own. Please check out our video messages from Keith Martinez, Kiva Sam and Scatter Their Own. We’re putting the COOL back into SCHOOL and our summit participants were excited about continuing in education! In 2013 we connected an elementary school from NY to a school on the Pine Ridge Reservation. The challenges of limited broadband on the reservation made the linking elementary schools challenging, but with perseverance on both ends of the dialogue, we were able to facilitate a dialogue. Students shared books, music and weather reports and learned about each others practices, hobbies and culture! We continued to provide reservation schools with supplies, backpacks, boots and coats for students and proper running shoes. Our shoe program resulted in the creation of strong cross country teams and running programs at reservation schools. We provided more than 6,000 books to schools and community organizations. We provided hundreds of boots and coats to children across the reservation. We continued to fund and supply holiday parties across the reservation, in Kyle, Pine Ridge and at schools. 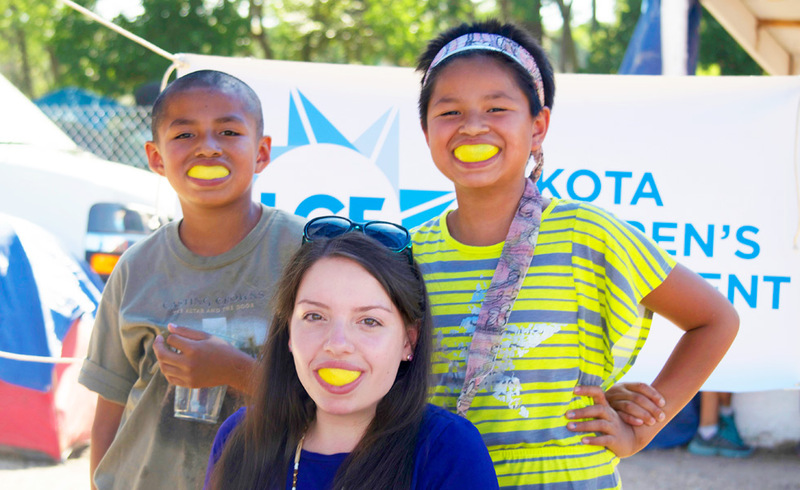 In 2013, our Youth Board members helped run the parties in Kyle and in Pine Ridge! For the first year, we maintained an information booth at the Oglala Lakota Pow Wow, which youth board members helped run. Lots of interested people stopped by to hear about our activities, to meet the youth who will lead our programs going forward and to read the poems from our Writing Challenge. We sponsored a Tiny Tot dance at the Pow Wow and Youth Board Chair Keith Martinez, along with Jetta and Stryker Tobacco helped congratulate the dancers and handed out prizes. We continued our sponsorship of a one-week cultural math camp run by Inila Wakan Janis and Jennifer Janis for girls on Pine Ridge. The summer of 2013 brought us a huge surprise as Doug Metz from the Scarsdale Agency, an insurance agency in Scarsdale NY, offered us pro bono office space! This provided us with room for a crop of interns to help us manage our programs and fundraising activities from a NY base. Read what some of our Interns had to say about their experience. In addition, as our VolunTEAM continues to grow, many volunteers earned Presidential Service Awards for their efforts! 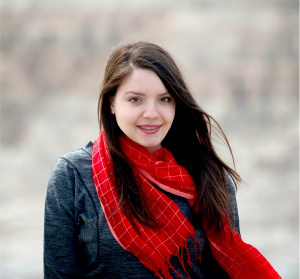 In April 2013, Maggie Dunne delivered a “Little Talks, Big Ideas” presentation at Colgate University’s Entrepreneur Weekend, and rocked the house with a talk entitled “Investing in Human Capital.” Maggie explained how she started working with the Oglala Lakota Nation, the obstacles she has faced along the way and why we need to face our nation’s history and continuing obligations, and forge the path towards reconciliation with the nation’s first peoples. On May 19, 2013, at Colgate University’s graduation ceremony, Inila Wakan Janis, Lakota activist and resident of the Pine Ridge Reservation in SD, interrupted the procession to conduct a Graduation Feather Ceremony, when he presented an Eagle feather (plume) and a Lakota Star Quilt to LCE President Maggie Dunne. On Tuesday May 2013, in Scarsdale NY, approximately 70 people came out to hear from Lakota Activist Inila Wakan Janis, Iranian-American Author and Journalist Susanne Pari and LCE Founder Maggie Dunne speak about the current state of indigenous rights in the USA, the conditions and inequities facing native communities (with specific emphasis on the Pine Ridge Reservation), and what the public can do to help facilitate change. In November of 2013, Maggie Dunne spoke at the Millennium Campus Conference as a Keynote Speaker with a Call to Action, ran a seminar on “Homelessness in the Homeland” and participated in a panel discussion regarding educational support efforts in underfunded communities. Due to an earmarked gift from a generous private donor, we switched from a blog to a new website!!! Please feel free to explore our entire website and share its content with friends and family! Our work continued to generate press. To keep up to date with what others are saying, please check out our PRESS PAGE. Please follow us on TWITTER to keep up to date on the news in Indian Country, on INSTAGRAM to see our amazing photos, and on FACEBOOK to read more about the accomplishments of our teams and volunTEAMS. We do not advertise our activities and we count on people like YOU to help spread the word!